René Lego is an award winning, Emmy-nominated producer, director and videographer. Since receiving her B.A. in Radio-Television-Film from Temple University in Philadelphia in 1996, she has produced, directed and shot a number of commercial, documentary and experimental videos. Rene's first short, The Philadelphia Textile Industry, documented the city's role in the American textile industry and was screened at the 1996 international textile competition in Kyoto, Japan. René worked as line producer and assistant camera on the Cardoso Flea Circus, a quirky experimental short shown in art galleries and museums worldwide. In 1999, she produced and directed a historical documentary tracing the legacy of forgotten Philadelphia radio pioneer Atwater Kent. From 1999 - 2001, Rene was the Senior Producer of "Philly LIVE", a call-in talk show airing weeknights on WYBE Public Television in Philadelphia. The program themes included International, Gay & Lesbian, Latino, Asian, African American and Local. "Philly LIVE" received a 2001 Mid-Atlantic Emmy-nomination for "Best Talk Series," and was presented with numerous Telly and Communicator awards, a Pennsylvania Broadcaster's Association award and a journalistic achievement award. Rene is a member of the International Documentary Association (IDA) and the National Television Academy (NTA) and lent her time and talents to the 2003 Annual Bosnian-Herzegovinian Film festival, 2003 LA/IFP Film festival and the 2002 AFI Film festival. 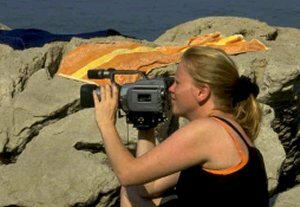 Her camerawork credits include CNN News, NBC News, In the Life TV and Sky Sports Europe. René is a freelance producer, still photographer and videographer.